Thank you to everyone who participated and entered to win the giveaways that ended this last Thursday and Friday. I greatly appreciate the support all of you have given me and the sites that I get to design for. Thank you so much! Gretchen W. who left a comment on Nov 17, 2013 @ 13:28:39 that said, “Well I did it, and glad I did. Love the Creative Embellishments and will need to order for Christmas. 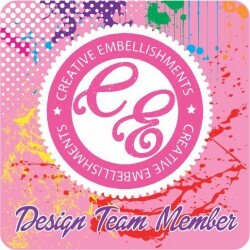 Great to be aboard.” You have won the $10 gc to the Creative Embellishments store! Congratulations!!! All entries must be made by 11:59pm Saturday, September 28, 2013 to be part of the random drawing. I will select 1 winner for the $10 gc from all the comments left on the Sketchabilities Sketch #99 reveal post that mention “hi” or my name in any way. 😀 I will select 1 winner for the HUGE Webster’s Pages/October Afternoon mystery prize from all comments here on my blog that let me know they played along w/the Sketchabilities sketch challenge. Thank you! “Today we are finally open for business. I am excited and nervous at the same time. I guess it’s due to my perfectionist personality. Honestly I didn’t realize how much needed to be done before we actually opened. It goes way beyond just designing and creating with the products. I am not the most tech savvy person but am definitely learning a lot. Ok I don’t want to bore you with all the specifics. A little about us…. 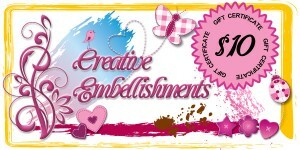 Creative Embellishments is a small, family owned company located in western New York that was started by my husband and I. Michael Kramer (the hubs ) is a prolific graphic artist who creates websites, mobile websites, logos and images for print design. Nicolle (that’s me..;)) is a stay at home mother of 4 and a passionate artist who has been actively creating for over 8 years. 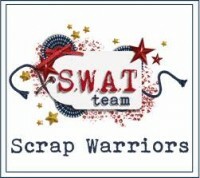 I enjoy altered art, mixed media applications and all styles of scrapbooking. What started out as a hobby, in order to pass down memories and family history to my children, evolved once I discovered the vast online community of artists and scrappers 3 years ago. Our goal is to design high quality, fun, inspiring, unique designs to bring out your inner creativity. 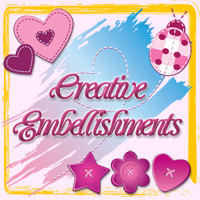 Creative Embellishments promotes positive growth as an artist and most importantly, having tons of fun while creating. We highly value our customers (friends) and aim to provide premium quality products at great prices and excellent customer service. We look forward to a bright future. Now for some fun! To celebrate our GRAND OPENING I am having a 20% off SALE (use coupon code CE20) and free shipping for a $30.00 or more purchase at our >>STORE<< . I am also having a giveaway of chipboard products valued at $40.00! 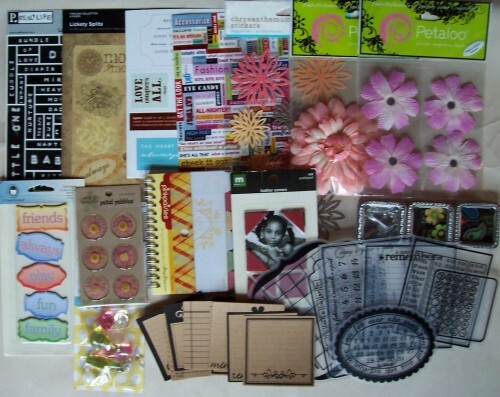 If you would like a chance to win these yummy chipboard pieces please follow this blog and leave a comment letting us know what item/s are your favorite in the Creative Embellishments Store. That’s it ..easy peasy!! For extra chances to win, do one or more of the following. NOTE: On the left hand side of this blog there are easy one click social media tabs. Become a fan on our FACEBOOK page and share this giveaway. Follow us on Twitter and tweet about the giveaway. Please leave a comment with a link to each one that was done. Check back on September 15th to see if you are a winner!! The winner will be drawn randomly! Thanks for stopping! From all of us at CE!! The New Webster’s Pages Commercial and your chance to win a $500 WP SHOPPING SPREE!!! 16 Mar 2012 Comments Off on The New Webster’s Pages Commercial and your chance to win a $500 WP SHOPPING SPREE!!! CLICK HERE to check out the post on their blog for your chance to win a HUGE $500 Webster’s Pages Shopping Spree!! !